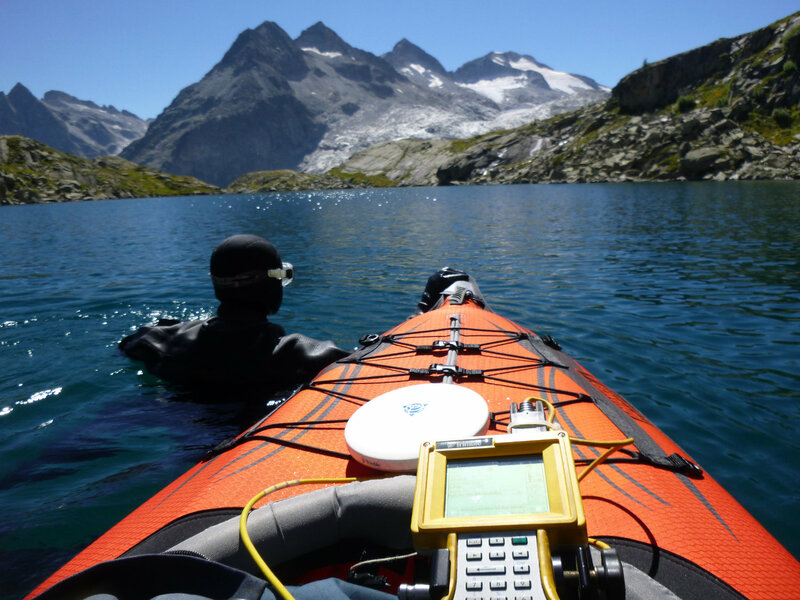 On August 25th and 26th 2016 a team of divers and archaeologists has explored the bottom of lake Mandrone (2.409 m.a.s.l. 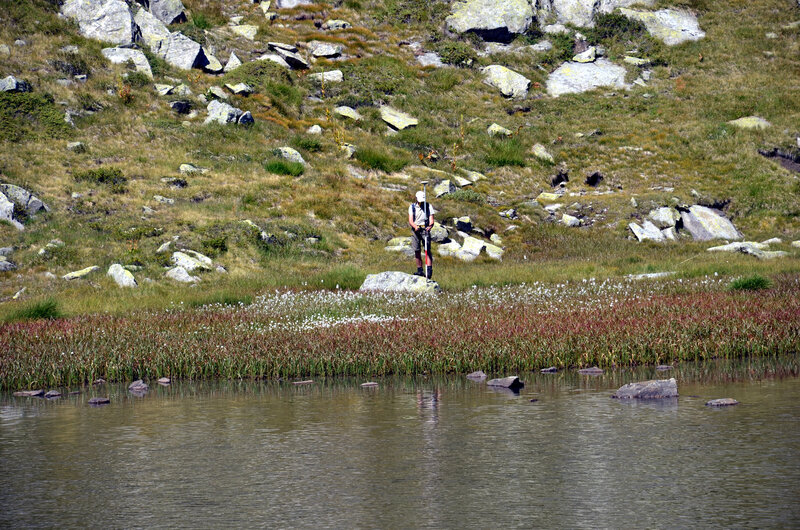 ), Adamello Alps/Italy. 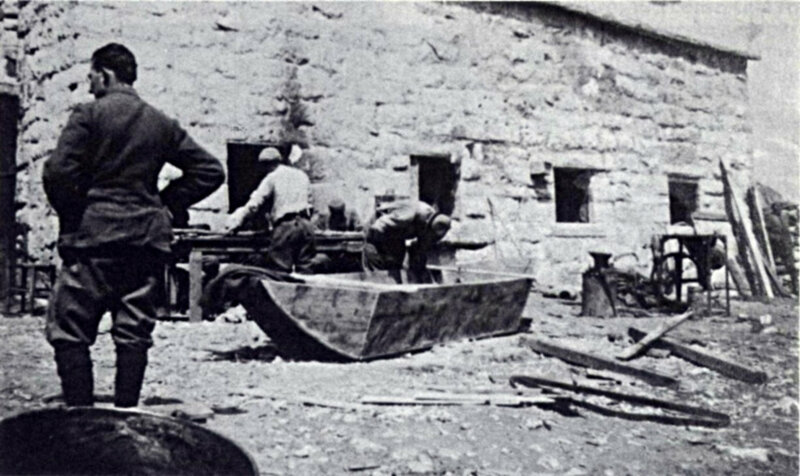 Under the direction of prof. Tiziano Camagna, the team has localized and documented the wrack of a boat build there during World War I.
Team-leader Tiziano Camagna was supported by the archaeologists of Arc-Team Ltd. (Cles/Sexten – Italy), Alessandro Bezzi, Luca Bezzi and Rupert Gietl. Massimiliano Canossa and Nicola Bonisegna, underwater-experts from NauticaMare DiveTeam, have realized high-resolution videos and photos. 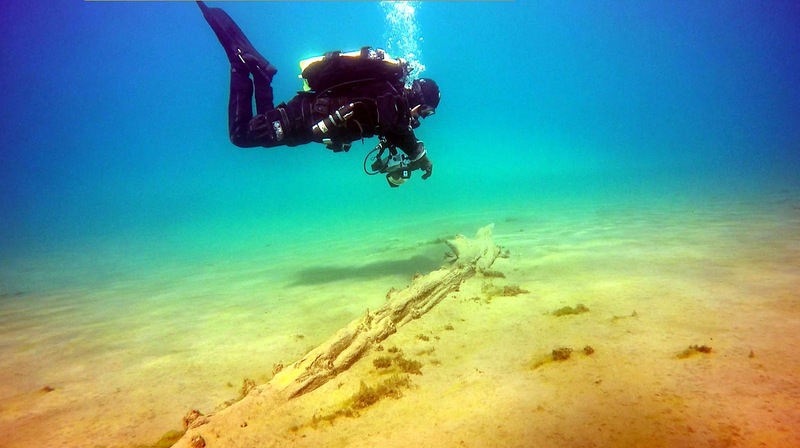 The main target of the mission was the localization and documentation of the wooden remain on the ground of lake Mandrone. 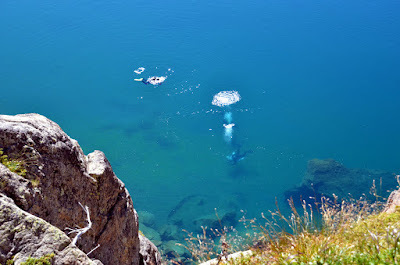 The boat was build between 1916 and 1918 and sank some years after the end of WW1. Pictures and videos taken by the divers will now be processed by the archaeologists in order to extract a detailed 3D model using Computer Vision technologies like SfM (Structure from Motion) and MVS ( Multiple View Stereovision). Tiziano Camagna first localized the remain in 2003, comparing it with two historical photos published by Luca Viazzi in the volume "I diavoli dell'Adamello - 1915 -1918 La guerra a quota tremila". The first shot is showing Italian mountain troops (Alpini) building a boat near the “Julius Payer” refuge, situated about 800m northeast from lake Mandrone. The second Capt. Castelli rowing on the lake. The Adamello Alps have been one of the highest war theaters of WW1. In the area around lake Mandrone and the refuge “Città di Trento” we can still find lots of archaeological remains of that period: Trenches, barracks, observation positions and a small military cemetery. Austro-Hungarian and Italian troops had not only to fight against each other, but primarily against the harsh climate on altitudes up to 3.900 m.a.s.l., 10-12 meters of snow in the winter and temperatures right down to -30°C (-10°F). Thanks to the support of the wildlife park “Adamello-Brenta” and the Gallazzinis, tenants of the refuge “Città di Trento”, the equipment of our expedition was transported on site with the goods cable lift of the refuge. The team went up by foot, walking about three hours starting at the head of “Genova” valley. 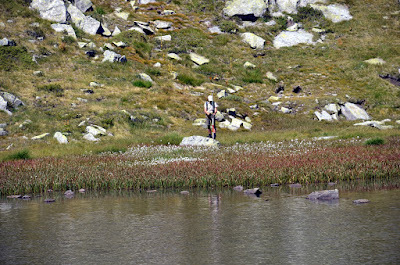 On the last stage, from the refuge to the lake, the gear was carried on the back. 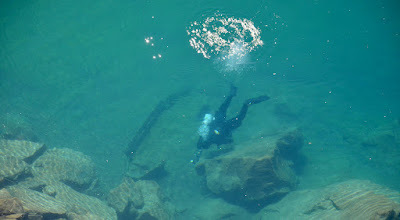 In order to facilitate the transport, divers choose light equipment like the sidemount system. During the dive our photographer Nicola Boninsegna localized a wooden trunk on the ground, a discovery that gives rise to some new research questions, considering the total absence of trees on that altitudes. The find will be analyzed soon, in order to get dating and identification of the species. This mission was also an opportunity for a high altitude test of our ROV prototype (Remotely Operated Vehicle), named ArcheoROV developed by WitLab laboratories from Rovereto, in collaboration with Arc-Team. Last but not least the team wants to thank the Department for Cultural Heritage of Trento (Office of Archaeological Heritage) for close cooperation. 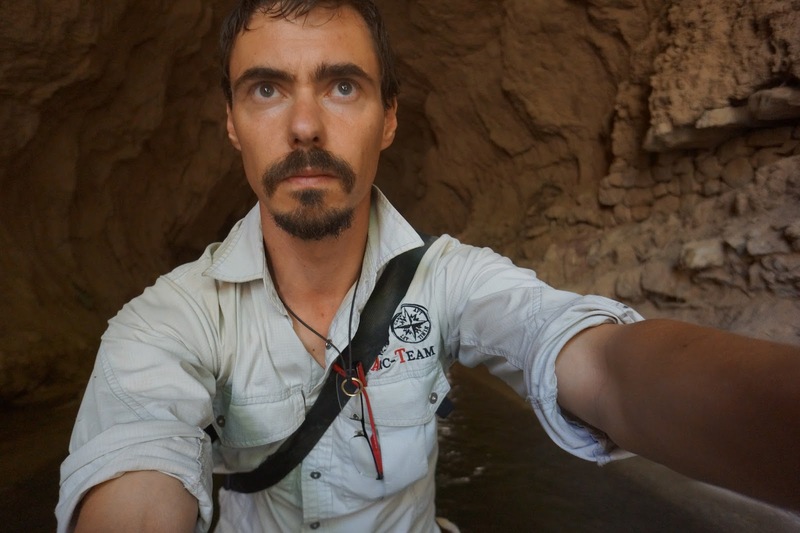 Following this blog, it may seem that modern archaeology consists mostly of hacking, compiling software and staring blankly at the computer-screen. But fortunately it's not always like that! Maintenance of cultural goods, for example, is a big challenge. Arc-Team is proud to contribute to that on numerous occasions. Like in this video: Two of us are members of the board of trustees "Schloss Welsperg". The castle was build in the 12th century and is cared by that association since 1989. Thursday 9th June 2016 in Vigolo Vattaro (Trentino - Italy) was held a conference regarding the figure of S. Paolina Visintainer, who was born in this town in 1865, and in general the immigration issue. Among the other interesting contributions, a special mention has to be made for the work about Italian immigration in Brazil during the XIX century, presented by Cesar Augusto Prezzi, which focused on the states of Rio Grande do Sul and Santa Caterina. This research illustrated the hard journey Italian and, in general, European migrants had to face to reach the new world, often losing their relatives along the way (in many cases buried at sea), in order to escape poverty and war (a story that sadly remembers the current travel of refugees). Our (Arc-Team) contribution to the conference regarded a more particular topic, connected with the person of St. Paolina: her Forensic Facial Reconstruction aimed to recover her smile. 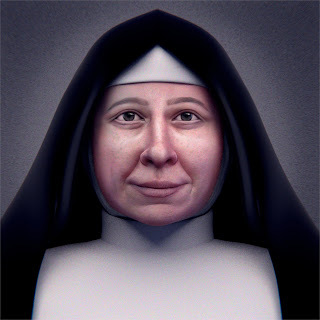 Indeed Mother Paolina is remembered as a smiling and good-natured person, but, due to the fact that the only photo we have were taken in sad moments of her life, we have no representation of her more natural expression. From this singular issue, +Cícero Moraes started to work in order to recover her lost smile, with the help of the artist Mari Bueno and Prof. José Luis Lira. Here below is the final image of the Forensic Facial Reconstruction of S. Paolina Visintainer, performed by Arc-Team's forensic artist Cicero Moraes, who also accomplished also the 3D documentation of the skull with SfM techniques. like always in ATOR, this material is released under CC-BY licenses. 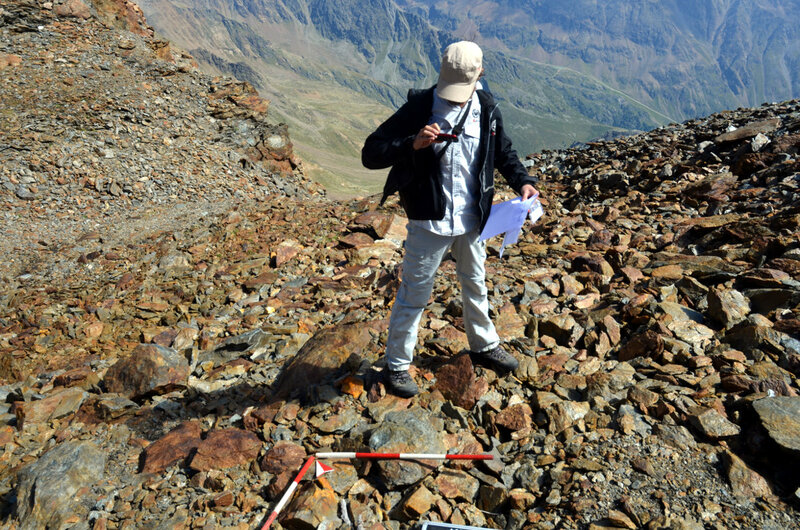 We've published a preliminary report in german language about our project on Langgrubenjoch (South-Tyrol) in the german journal Archäologisches Korrespondenzblatt. 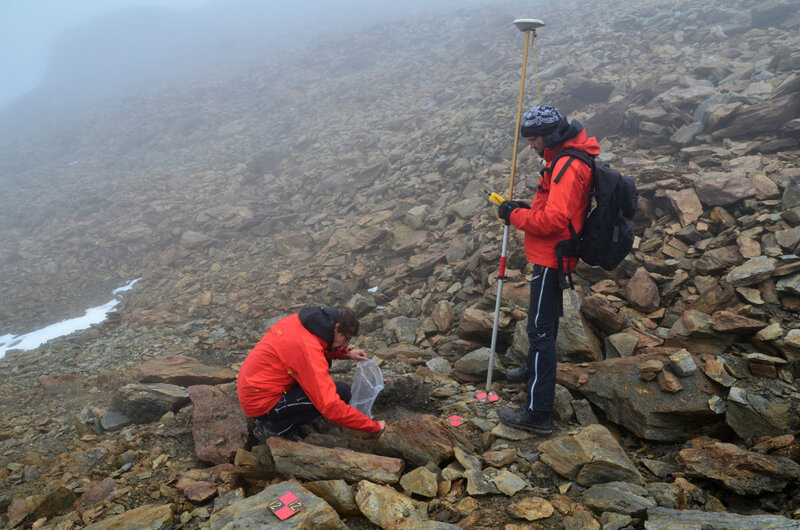 Finds from thawing névés and ice fields were discovered at the Langgrubenjoch (3017 m a. s. l.) between Matscher- and Schnalstal in the southern Ötztal Alps. The finds are predominantly made up of wooden parts, many of which are fragments of boards and show tool marks. First radiocarbon and dendro dates reveal artefacts dating back to the Copper Period, middle to late Bronze Age as well as the Roman period. 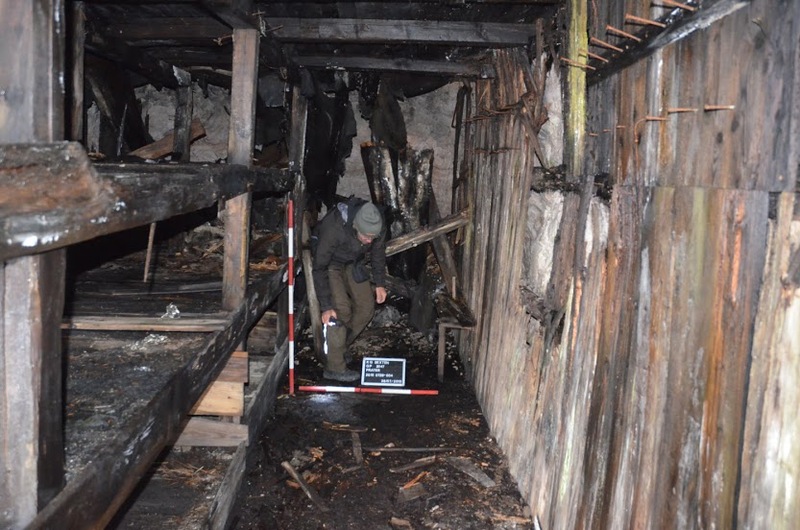 The toolmarks and comparable finds suggest that the pieces of boards consisting of larch (Larix decidua) were the remains of the roof shingles of a late Bronze Age hut. Although the Langgrubenjoch cannot be crossed easily it is the shortest route between the Obere Vinschgau in the area of Mals and Schnalstal and the region north of the alpine main ridge. The periods of time indicated by the finds, i. e. the late 3 rd and 2 nd millennia BC as well as the Rom an period, witnessed a relatively low extent of the glaciers or warm phases. In those times the Langgrubenjoch was possibly easier accessible and therefore used more intensively. 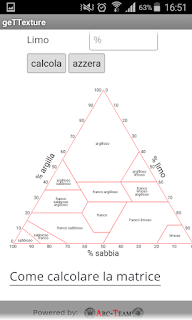 Archäologisches Korrespondenzblatt 46 (2016) 167-182.
as I wrote in this post, I am building a very simple Android app in order to use geTTexture (the automatic Soil Texture Tirangle +Giuseppe Naponiello developed) from the mobile, directly on the field. 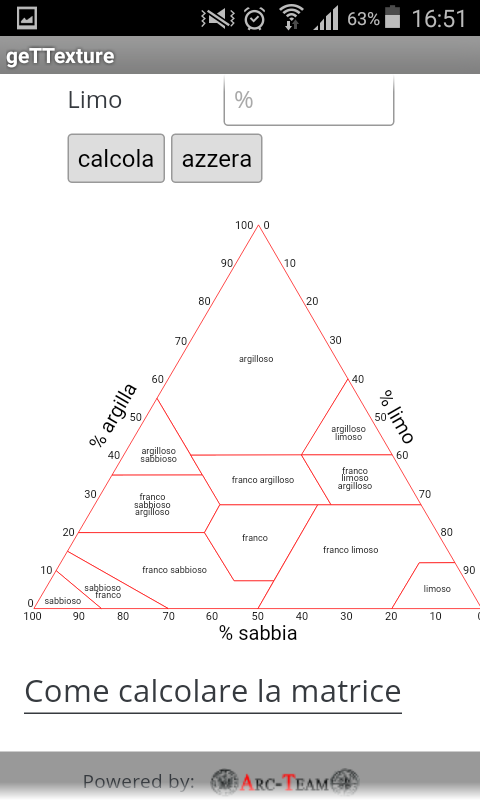 Thanks to the work of +Giuseppe Naponiello the website is now optimized also to be viewed from a mobile's monitor (due to the fact that now the Soil Triangle can be automatically scaled), so that if you have an internet connection on your excavation, you can use geTTexture to define the soil texture of your archaeological layers in a semi-automatic way. By now the mobile app is a simple link the geTTexture developed with MIT App Inventor. Nevertheless I uploaded also the source code of the project on Arc-Team's githup repository (released under General Public license), where you can find also the main software (released under Creative Commons Attribution). Here you can find the binary apk file, to install the app on your mobile. If you want to use geTTexture on your PC or laptop, than you can use this direct link. As you probably noticed, one of the topic of ATOR is related with hardware hacking, with the aim to build new archaeological devices from ordinary objects and tools (33). This concept is close to the one of "reuse" (using an artefact for a purpose which is completely different from the original function), a pretty common phenomenon in archaeology; also in architecture there is something similar, called "spolia" (but maybe our interest in hacking things is just a kind of McGiver syndrome of people grown up in the 80s). However, this post is about hacking a common game device like Kinect to use its characteristic in archaeological 3D real-time documentation. If you are a regular reader of ATOR, you will know that we already face this challenge, performing a first test (1) with RGBDemo in February 2012, and controlling accuracy and precision of the device in March of the same year (2), after a discussion with some of the researchers of FBK, during the workshop "Low cost 3D: sensori algoriti e applicazioni". Due to the encouraging results achieved in our first experiments, we worked on the hardware in order to modify it for outdoor projects (3), but soon we experimented the limits of this technology when applied in areas with direct sunlight (4) or in documenting small objects (5, 25). 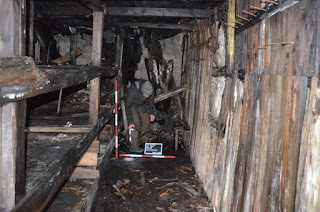 Despite this drawbacks in our research, Kinect worked pretty good in indoor excavations (6), helping us in difficult situations (related with the the workplace safety), and for particular purposed, like for infra-red prospections in dark environment (7). After all these experiences, our final advice about Kinect is that the device has a potential in archaeology, but its real employment in professional work is restricted to peculiar conditions, while in most of the cases the SfM-based techniques are the best option (due to their versatility, which makes them a perfect choice during missions abroad (8), for small finds documentation (9, 10), for underwater and aerial archaeology (11, 12, 13), considering also the speed which characterize SfM and MVSR open source software development (14) and the wide range of possibilities between the different tools (15, 16). Well, at least this was our opinion until now... Currently we are changing our mind about Kinect, and this is due to our professional engagement in underground archaeology (17) and to our renovate interest in robotics. Let's deal with these two points separately. Like any other operation in archaeological 3D documentation, the tolerance regarding accuracy and precision is variable and influenced by some factors, and mainly: research purposes, logistics, characteristics of the structures to be documented. 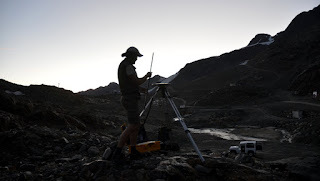 Without considering some important exceptions (e.g prehistoric rock shelter, which are often simple to document with SfM techniques), most of the structures related with underground archaeology (WW1 artificial caves, medieval mines, etc...) are connected with large scale survey projects (where it is important a "big data" approach, raising the tolerance in data acquisition to increase the number of documented structures); with logistically difficult areas (high mountains, glaciers, (18, 19) etc...); with structures often characterized by vast surfaces without important small details, which (when present) can be recorded with a targeted SfM or RTI (21, 22) documentation (e.g. for graffiti, inscriptions (20), manufacture traces, etc...). For this reason, in most of these projects, it is necessary to deal with precision in documenting (keeping checkpoints thanks to other TOF instruments, like total stations) in order to gain a real-time response from the selected device, and, under this point of view, Kinect is often a good solution, considering also that its infrared sensor helps very much in low light conditions (7). Since 2006, when we joined an aerial archaeological project in Armenia (23), we started to work on "archaeorobotics", trying to develop robotic devices able to help us in the most difficult archaeological missions. 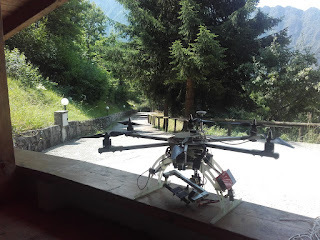 The first positive results we reached in this field were related with aerial archaeology and the building of an open hardware UAV (in 2008), even if at the beginning we underestimated the time needed to practice with our new tool (24). 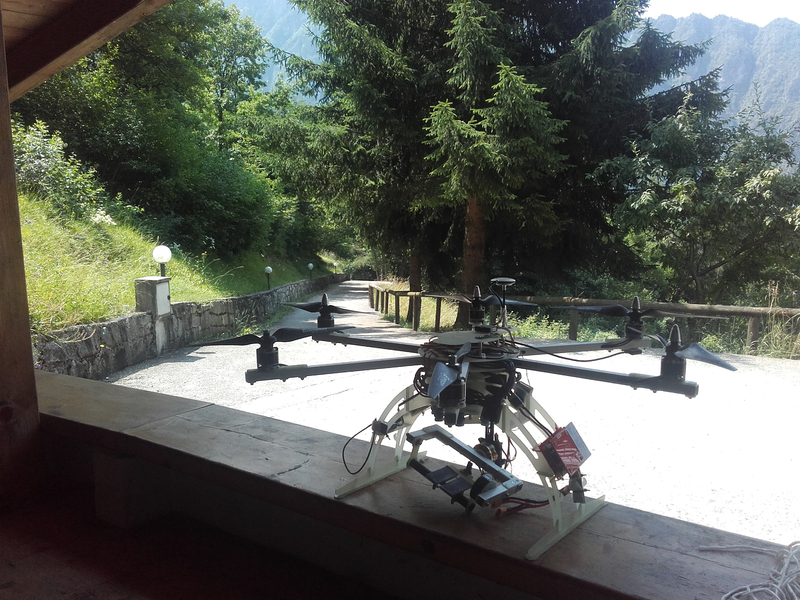 Soon our experience increased as we built different drones, based on open and closed solutions (like kk multicopter (26) or Naza dji (27) models). The benefits of this research branch were clear (28, 29) and soon other research institutions, like the CNR-ITAB of Rome (30), the University of Lund (31) and the CNR-ISTI of Pisa (32), asked us to give lessons about this topic. Another field of archaeorobotics we explored is the one related with CNC machines and especially with 3D Printers. For this topic a precious help came from the society Kentstrapper and Leonardo Zampi (aka +Exekias 87), who helped us in 3D printing the cast of the Taung Child (34, 35). Since RepRap project started (in 2005), 3D printers evolved very fast. Of course our interest regarding these machines is mainly oriented to Cultural Heritage, and this is also the reason why we built a Fa)(a 3D form scratch (36), but results with this kind of instruments can be very impressive, especially considering the wide range of scientific applications (37, 38, 39, 40, 41), even if sometimes you have to deal with difficult boolean operations (42). However, none of the robotic projects we developed till now needed Kinect, being based on UAV, to 3D document archaeological sites, or on CNC machines, to fast replicate archaeological artefacts. 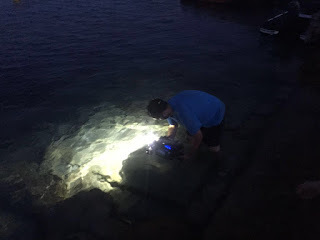 Our renovate interest in Kinect for archeorobotics is due to our new challenge in developing a ROV (Remotely Operated Vehicle), in order to assist us in our underwater archaeological missions. 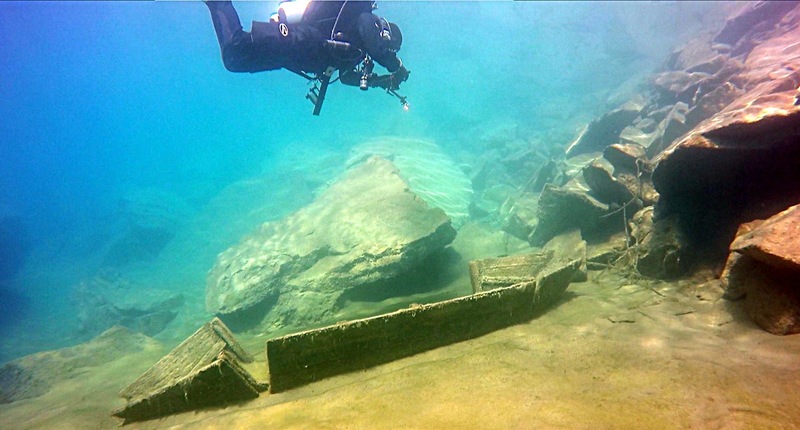 Indeed, in the last months, we started a collaboration with the WitLab, the FabLab of Rovereto (Trentino - Italy), to develop a new Open Hardware ROV, especially designed for archaeological aims. One of the main topic in developing such an instrument is that the new robot will be oriented not only to 3D documentation, but also to the exploration of unknown areas. 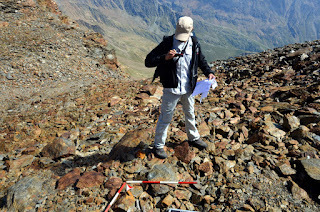 For such reason SfM and MVS software are no more enough, but we had to start again in testing Open Source SLAM (Simultaneous Localization And Mapping) algorithms, due to the fact that we need to register in 3D the submerged landscape (Mapping), but also to recover the path the "ArcheoROV" did (Localization) to reach new hidden archaeological evidences (for a better planning of human operations). The importance of SLAM algorithms in exploring devices is the main reason why we started again to experiment Kinect. Indeed, despite Kinect cannot be used as an on-board optical device in our ArcheoROV (due to the infrared camera), this tool is the perfect system to check SLAM software. As you can see, the performance of real-time 3D is pretty responsive, respect our old experiments with the Open Source software RGBDemo (also considering that the Kinect used in this video is the first version, and it is now pretty obsolete) and, most important, the localization function within SLAM algorithm works very good. As I wrote at the beginning of the post, our current impression is that this combination of hardware (Kinect) and software (ROS) can be a good solution for underground environment documentation, while the software can be the right choice for archaeological exploring robotic devices. I hope that this long post will be useful, if you have any feedback, please just write your comment below. Have a nice day! we will present the ArcheoROV at the ArcheoFOSS (43) of Cagliari (Sardinia - Italy), this year. Also our partner of WitLab will be with us!